Carl Hiaasen is well-known as the master of comic, sickly funny South Florida crime novels. Tim Dorsey is like Carl Hiaasen on a cocktail of meth and acid. 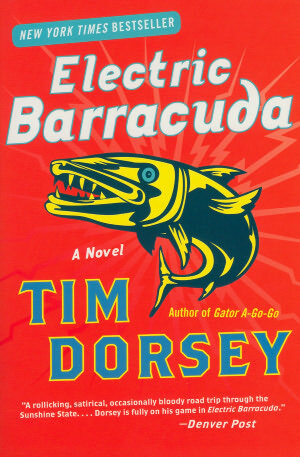 Electric Barracuda, Dorsey’s 13th novel, features Dorsey’s perennial protagonist Serge Storms. Serge Storms, that loveable thermonuclear vigilante and one-stop-Florida-trivia-shop, has been leaving corpses strewn across the Sunshine State for more than a decade. The authorities—especially one tenacious state agent—have begun to notice the exponential body count, and send a police task force to track down Serge. Could his luck finally have run out? Meanwhile, armed with his perpetually baked sidekick, Coleman, Serge decides to blitz the state and resurrect his Internet travel-advice website—which, of course, must be the finest and the final word on trekking the Sunshine State. To up the ante, Serge concocts a theme vacation for his cyberspace audience. And that theme? You, too, can experience Florida through the eyes of a fugitive. Off they go blogging along a getaway route through the state’s most remote bayous, back roads, and bars, where the number of cadavers begin stacking up like Serge’s website hits.